Takes 14.4V or 18V Battery (BL1415,BL1430,BL1815,BL1830). 9 or 22 hours BL1830. Rotating head to direct light exactly where needed. 7 or 16 hours BL1430. Weight: 0.3kg. 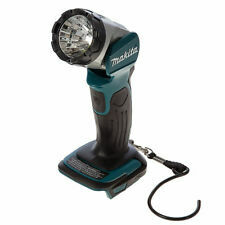 Makita DML802Z FLASHLIGHT LI-ION 14.4/18V. Aluminum flashlight head design for increased durability. 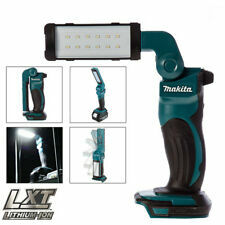 Makita DML802 18V / 14.4V LXT Lithium Ion 9 Position LED LIGHT Lamp Pivot Torch Stock Code: DML802Z The Makita DML802 has a 3.2 Watt LED with 160 lumens light power. The lamp has the ability to tilt in nine different positions which means no matter where you need the light to point the lamp wont let you down. Features of DML802 3.2 Watt LED 160 lumens light power Ability to tilt in nine different positions which means no matter where you need the light to point the lamp wont let you down Can be powered by either 14.4v or 18v li-ion batteries from Makita Specifications of DML802 Operating time max: 13/9 h Battery: 18 V / 14.4 V Weight: 0.65 kg Dimensions: (L x W x H) 256 x 79 x 99 mm Operating time (hours): 13-3.0Ah, 1.3Ah 6-(18V) / 9-3.0Ah, 1.3Ah 4 (14.4V) Total Shipping. Product Number : H14R.2. A simple turn of the head to refocus and a flawless flood beam for near illumination is perfectly achieved. An eco-friendly Transport Lock prevents the light from being switched on by accident so draining the battery unnecessarily. Can affix the light to any ferrous surface, set the desired angle, and lock the angle with the tension ring. Type: Torch. The Item can continuous illumination for 3 hours. The chassis has a magnet absorbing design,you. 1W superbright LED bulb. LED charging indicator. 3 YEAR – for power, air, petrol tools. Fair wear and tear and consumable products are not covered. Warranty Information. Weatherproof construction. MAKITA DML185 18V Cordless Torch. - 18v torch for use with lithium ion batteries. - 4 position pivoting head. - Falling impact strength of 1m. - Rubberised soft grip of ergonomic design. - Weight : 0.36kg. Images are for illustration purposes only. Bulb Type : LED. View this range. Number of Batteries : 3. Beam Distance : 100m. Battery Size : AAA. Colour : Black. Overall Length : 170mm. The Nebo Big Larry Pro, a pocket sized torch and lamp with incredible lighting power. Pretty much the only torch you'll ever need. A powerful magnet in the base lets you attach it to a variety of surfaces, at any angle, keeping your hands free. LED Qty: 5W COB. Length: null. Power by: 2 x 18650 batteries 3.7V 4000mAh. 1 Headlamp 1 USB Cable 2 18650 Batteries. Model of LED: T6. We will always here to solve them for you. It won't help the problem to be solved. Adjustable base is provided for each head lamp, with back and forth inclination. • High-power red hazard flasher. • Work light is concealed inside the flashlight body. • Length: Compacted: 6.875” / Extended: 9”. • 0.8 lbs. • Micro USB to USB cable included. • Work light automatically turns ON when opened. (180 standard LED's or 5 million candle power!). Integral adjustable foot allows the spotlight to be positioned at a number of different angles. The spot light is ideal for outdoor activities including camping, hiking and festivals. You are allowed to change 3 ways of lighting as your request by pressing the red button. Brightness: 2400 LM. Operation mode: High-Low-Flash-Off. Bulb type: 20W COB LED. 1 USB Charging Cable. LED service life: 100, 000 hours. The Nebo Rebel is the first ever head torch in the Nebo range. Nebo Rebel LED light x 1. Featuring three brightness levels and Strobe, the torch is turned on and off with the push button. If the torch is on in high or low for longer than 5 seconds then the next press will turn the light off. Sealey LED307 Cordless 24 SMD 7 LED Lithium-Ion Rechargeable Inspection Torch Triple Pack Stock Code: LED307_3 Heavy-duty housing features 24 super bright SMDs. 7 LED in the end for use as a directional torch. 360° Hanging hook and a magnet on rear of lamp for hands-free applications. 3.7V Lithium-ion 1.4Ah battery. Single LED battery indicator. Supplied with 12V in-car charger and mains Specifications of the Sealey LED307: Model No: LED307 Battery: 3.7V - 1.5Ah Li-ion LED Quantity: 24 SMD 7 LED Lumen Output Side/Top: 180/50lm Operating Time Side/Top: 16/3hr Charging Time: 5hr Length: 210mm Pack QTY - 3. The PRO also has a powerful magnetic base and adjustable steel clip for convenient hands-free lighting. When there is work to be done.bring a PRO! The BIG Larry. Powerful magnetic base. Two magnetic charging stations and cables. Stock Code: DCL050N Features Benefits DCL050N Variable light settings for maximum brightness or extended runtime250-500 lumen output with broad and even beam patternUp to 10 hours' runtimeNine position articulating lamp head for directional control of light outputExtendable hanging hook allows worklight to be suspended during use Specifications of DCL050N Voltage: 18 VBulb Type: LEDLight Output: 250-500 lumensProtection Class: IP54Height: 345 mmLength: 95 mmWeight: 1100 g.
Specification: Brand new Color: Black Weight: 190g Model of LED: T6 Material: Aluminum alloy Switch Type: press On/off Zoom mode: Telescopic zoom 3 switch Mode: high / low / strobe Power by: 2 x 18650 batteries 3.7V 4000mAh Waterproofing design Aluminum alloy casing Aluminum alloy reflector Output bright can come to max 25000-30000 lumens Adjustable base is provided for each head lamp, with back and forth inclination Internal wiring applies the high efficient booster circuit, working voltage is wide and can utilize the batteries in the largest extent. 3 watts of COB LED for super bright illumination. Torch function has 1 watt of COB LED. Bookmark Us. AC and DC power adapters included. The brightness levels are operated with the push button switch, which is easily operated with one hand for convenience and the non-slip body design ensures you'll keep a tight hold. Reveal the port by removing the rubber dust protection cover and then simply plug the included micro USB cable into the charging port and the other end into a computer/laptop or a suitable USB adaptor. Rechargeable Tactical 30000LM T6 LED Headlamp 18650 Headlight Head Torch Light . 5W CREE lamp beads, 3 modes white light and 2 modes red light for SOS mode, can maintain the light up to 15-20 hours(depending on the mode you are using), powerful to fishing, hunting, night running hiking and camping. Energy efficient long lasting LED's ( Up to 100,000 hrs). 60 LED Work light. 60 LED Worklight a. LED Life 100,000 Hours. Strong adjustable magnetic mount.